Sumptuous and tasty, Stuffed Parathas fit into any meal. It can be served as the main course of a multi-course meal or it can be served as a one-dish meal because it is quite wholesome and satiating when stuffed with veggies, lentils and other such ingredients. Moreover, if the filling is spiced up properly, then you can simply serve the parathas with curds or raita and do not have to bother about preparing any other accompaniment. The best part is that stuffed parathas are usually quite easy to make and you do not have to fuss in the kitchen for too long! Some stuffed parathas clearly classify as all-time classics! They have withstood the test of time and continue to be hot favourites with people of all age groups. If you are looking for some such options, look no further than the Aloo Paratha, Paneer Paratha or Stuffed Cauliflower Paratha. In fact, we have a special recipe for How To Freeze Aloo Parathas, which can be half-cooked and frozen in the deep freezer for a month. Whenever you want, just thaw a paratha and cook it. It tastes so fresh, as if it has been made just now! The Stuffed Spinach Paratha and Stuffed Methi Paratha are awesome ways to sneak some greens into your meal. The Dal Parathas and the Paneer Stuffed Green Pea Parathas are wholesome treats that are quite filling. You can also use healthy millet flours to make your parathas. The stuffing ensures that the parathas are soft and tasty. Try the Spicy Bajra Paratha. Kids love cheese, and sometimes grown-ups also enjoy the gooey richness of cheese in their food. When you are in the mood for a cheesy treat, try the Cheese Paratha or Rajma Cheese Paratha. The Pizza Paratha is an innovative option, which is sure to delight kids! 1. The dough should be soft but not too soft, which makes it difficult to roll. 2. The stuffing should not be watery. 3. Cool the stuffing completely before using. 4. When you stuff the filling inside the dough, make sure you seal it well before rolling again else it will spill out. 5. Cook on a medium flame with ghee or oil till both sides are nicely cooked and golden brown in colour. Gobi and mooli are abundantly found in the Northern region. Making use of these local vegetables and lot of dairy products, Punjabis make a lot of stuffed paratha recipes. Breakfasts are wholesome consisting of various parathas like aloo paratha, paneer paratha or gobi paratha laden with freshly made safed makhan. These stuffed parathas are generally served with fresh curd, pickle and tall glass of sweet lassi to make a full meal. You can even combine two or more vegetables to make unique combination like vegetable paratha, aloo methi parathas and aloo gobi ke parathe. Making fresh vegetable puree or chopping them finely, you can directly add them to the dough and fortify it to make delicious meals. One of my favorite is the onion paratha which has a unique crunch in each bite. During my school days mummy mostly packed my tiffin with nicely buttered parathas wrapped in foil paper. My lovely mom knows that I liked eating parathas very much. From last few days I noticed that Mummy started giving each day a tiffin for my college break with varieties of parathas stuffed with paneer, aloo-methi, onion, sometimes mixed veggies,Gobhi-Paneer-Palak etc. When i asked her how come you started giving such beautiful treats. She told that my raja beta love parathas so i searched on Internet and got the paratha treasure on www.tarladalal.com. 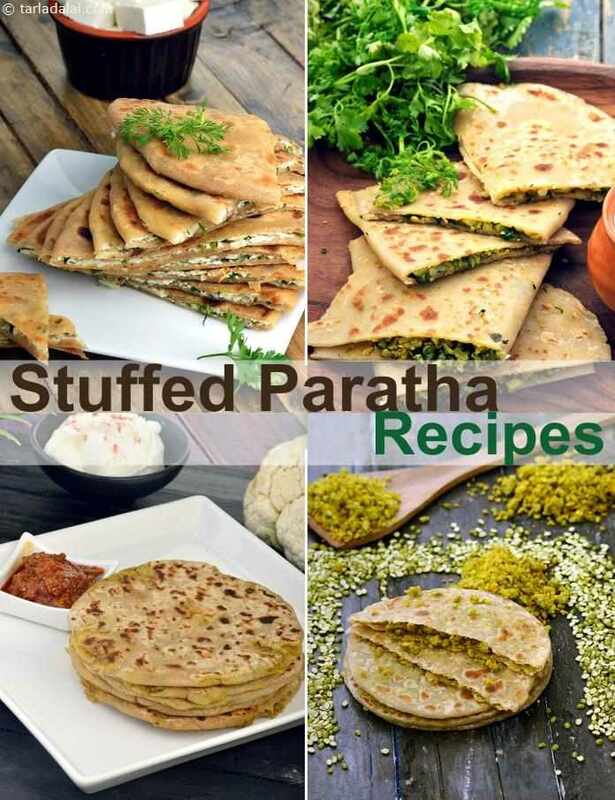 later on she mailed me this page link to choose the parathas recipes of my wish. Gone through the parathas collection, write up, info & suggestions of making parathas**** its easy and wonderful. Paratha recipes are very taste and amazing.